Although nothing beats attending Family Medicine Forum (FMF) in person, we know taking time away from your practice or family responsibilities can be a challenge. That’s why we offer a selection of streamed sessions through FMF Live, so you can take part no matter where you are. 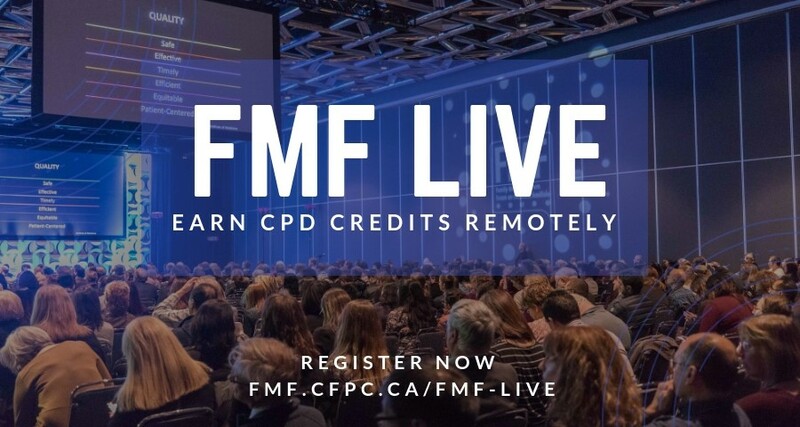 The FMF Live sessions have been certified through Mainpro+® for up to six Group Learning credits on Thursday, six on Friday, and four on Saturday. They include our fabulous keynote speakers and all sessions are available in English and French. Check out the schedule below for more details. Registration for FMF Live now open! Have questions? Please contact [email protected]. Live stream the full day for $180 and earn up to six certified Mainpro+ Group Learning credits. 1115–1215 T468: Hear Ye, Hear Ye: The COPD management paradigm has shifted! Live stream the half day for $120 and earn up to four certified Mainpro+ Group Learning credits.